It’s been a rough couple of days for Toronto Blue Jays players in the field. On Sunday, Lourdes Gurriel Jr. botched a routine throw to second base. He was taken out of the game and sent down to triple-A shortly afterwards. 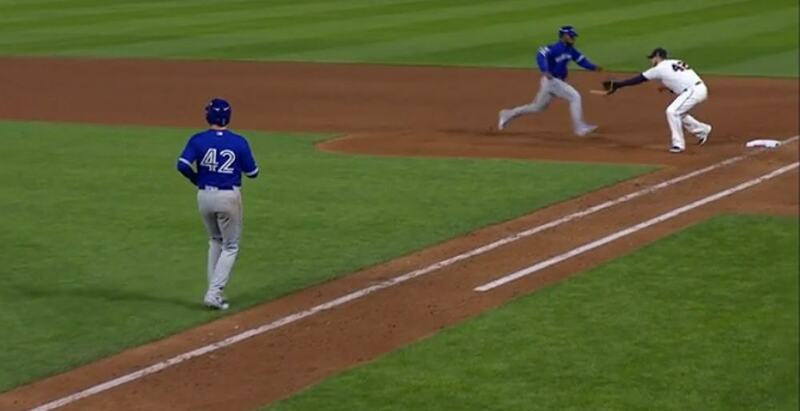 Then on Monday, the Blue Jays found a new way to get thrown out at first base. With Teoscar Hernandez on first base, Brandon Drury took what he thought was ball four at the plate. He started taking off his equipment and headed towards first. The only problem? It was only ball three. It set forth a very unusual chain of events which led to Hernandez getting picked off at first base. Drury thought it was ball four and when Hernandez followed suit and a few seconds later, Twins players clued in and threw the ball back to first base. You couldn’t duplicate this scenario if you tried. Both Drury and Hernandez got caught napping, but Hernandez was the one who made the egregious error in this scenario. Not knowing how many outs there are — let alone the count — is a cardinal sin in baseball. Fortunately, Hernandez didn’t wear the embarrassment for very long. In his next at bat, he sent this towering go-ahead home run into the third deck at Target Field, helping the Jays to a 5-3 win. That’s one way to get the monkey off your back. One wouldn’t expect the Blue Jays to demote Hernandez for a play like this, but these are baseball fundamental faux pas that drive managers insane. Charlie Montoyo was likely none too pleased with the result from that play.